The ACC released the much anticipated men’s basketball schedule Thursday. Virginia opens conference play on Saturday, January 5 with a 3 p.m. home game against Florida State and closes with Senior Day against Louisville on Saturday, March 9. Everything in between will once again be a challenging course for teams in one of the nation’s most talented leagues. UVA has won three of the last five ACC Regular Season Championships and two conference tournament titles in the same five-year span. The regular season crowns came in 2014, 2015, and 2018, while the Hoos captured the two tourney trophies in 2014 and 2018. A year ago, Virginia finished 17-1 in league play to take the regular season title ahead of Duke (13-5) and then won three ACC Tournament games to claim 20 conference victories for the year. The chase for a fourth title looks tough as expected in the ACC. The full schedule can be viewed at the end of this article or here. Some schedule highlights follow. While the Hoos open at home with FSU, they play five of their first eight conference games on the road. In the conference season’s first week, the Cavaliers take trips to Boston College and Clemson with tipoff times at the opposite ends of the spectrum. The game with the Eagles is at 9 p.m., while the game against the Tigers is at noon. The total driving miles for those two trips would be approximately 954 miles. 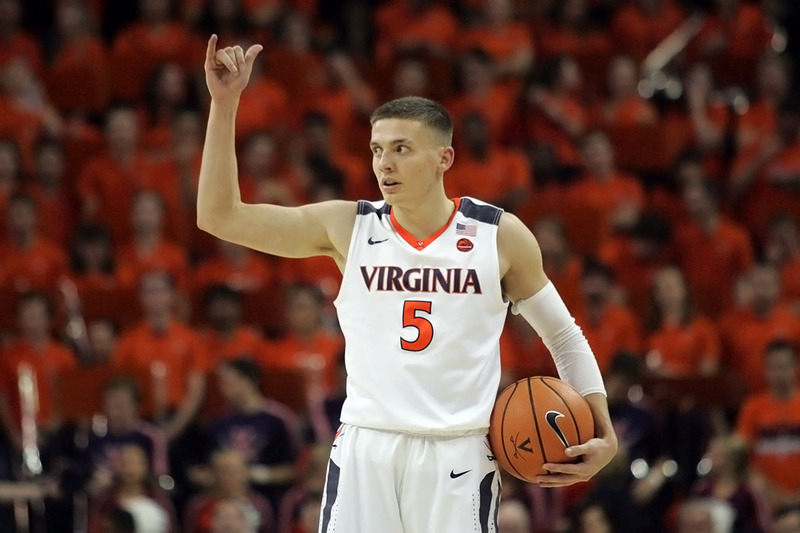 In addition to the finale with Louisville, UVA plays three of its final four games at home. Two potentially tricky home games on the schedule appear on consecutive Tuesdays. The Wahoos host the Hokies on Jan. 15 for an 8 p.m. tipoff, while Wake Forest comes to Charlottesville on Jan. 22 for a 9 p.m. game. The dates for the previously announced home-and-home contests with Duke are Saturday, Jan. 19 at Cameron Indoor Stadium and Saturday, Feb. 9 at John Paul Jones Arena. That second game with the Blue Devils is part of three quick Saturday-Monday turnarounds for the Cavaliers with all three ESPN “Big Monday” games falling on the road. UVA hosts Duke and then plays at North Carolina two days later on Monday, Feb. 11 in the first two-game sequence. That’s followed by Notre Dame at JPJ on Saturday, Feb. 16 and a trip to Virginia Tech on Monday, Feb. 18. The final two-for-one deal comes with Pittsburgh at home on Saturday, March 2 followed by a road game at Syracuse on Monday, March 4. Virginia plays home games on six Saturdays. That includes every Saturday but one from the Feb. 2 game with Miami through the March 9 game with Louisville. That means the Cavaliers will be at home for five of the season’s last six Saturdays. The Hoos face the Cardinals on the road on Saturday, Feb. 23 as the only weekend game on the road for that stretch. UVA plays no Sunday games in ACC play. The previously announced non-conference schedule features two Sunday games against George Washington (Nov. 11) and VCU (Dec. 9). The road game at Notre Dame will be televised on CBS. Virginia and Duke faced off on CBS last season. This is the third straight year and fourth time in five years that the Hoos will play at Syracuse. Last year, the announced attendance at the Carrier Dome was 27,083. The 2014, 2015, and 2017 games between the two teams in the building have averaged 26,658 in attendance.